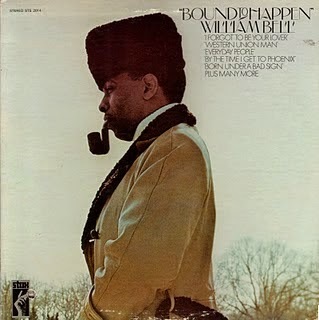 William Bell is an American soul singer and songwriter. William Bell had been with Stax Records pretty much since the beginning, but for whatever reason he didn't actually start having hits until the late 60s. He was teamed up with other singers on the label for a number of singles, including Carla Thomas, Mavis Staples and Judy Clay. The most successful was with the otherwise little-known Judy Clay - "Private Number" charted at #17 R&B in 1968, and also managed to get into the Top 10 in the UK. The same year he had a high-charting solo single - "I Forgot To Be Your Lover", co-written with Booker T Jones, got to #10 R&B. The next year a full album was released on the back of its success, produced and arranged by Jones and with backing from The MGs. It was actually only his second ever solo album, despite having recorded for Stax all the way through the 60s. It was a great record full of great songs and great arrangements. Being recorded at the end of the decade, it had a different, more smooth sound in comparison to recordings from the earlier, more recogniseable 'classic' Stax era. It featured "I Forgot To Be Your Lover" and a couple of other lesser singles, plus his own versions of songs that he had written for other artists - "Born Under A Bad Sign" (originally done by Albert King) and "I Got A Sure Thing" (originally by Ollie & The Nightingales). It also featured some surprise covers of Sly & The Family Stone's "Everyday People", Jerry Butler's "Hey, Western Union Man" and Jimmy Webb's "By The Time I Get To Phoenix".